Chicago – A new analysis of a patient support program (PSP) for TNF inhibitor maintenance in rheumatoid arthritis (RA) has generated additional evidence that tight disease control improves outcomes. Previous evidence from the same study associated PSP with improvements in clinical, functional and patient-reported outcomes at the end of 78 weeks. In the new data presented at this year’s ACR/ARHP Annual Meeting, enrollment in the PSP was associated with a greater likelihood of regaining disease control after flare. Both sets of data support the premise that increasing the amount of time a patient remains in a state of low disease activity (LDA) improves quality of life and may prevent disease progression. In a published trial called PASSION, a proprietary PSP program designed to provide support for RA patients on maintenance adalimumab confirmed a significant benefit (Van den Bosch F et al. Rheumatol Ther. 2017;4:85-96). 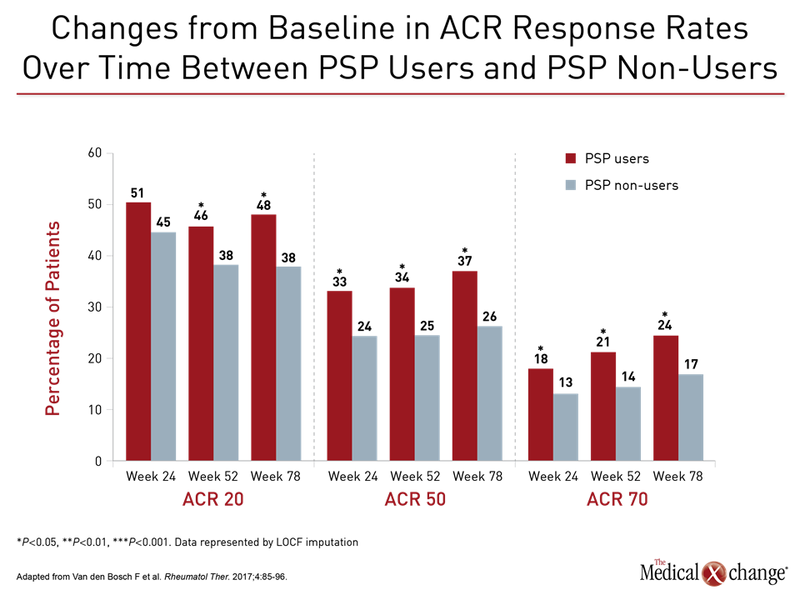 Relative to those who were also on adalimumab but not participating in the PSP, enrollment was associated with clinical improvements on multiple clinical outcome measures, including ACR20, ACR50, ACR70, and CDAI at weeks 24, 52, and 78. Enrolled patients also reported better disease control on patient-reported outcomes, such as the Health Assessment Questionnaire-Disability Index (HAQ-DI). 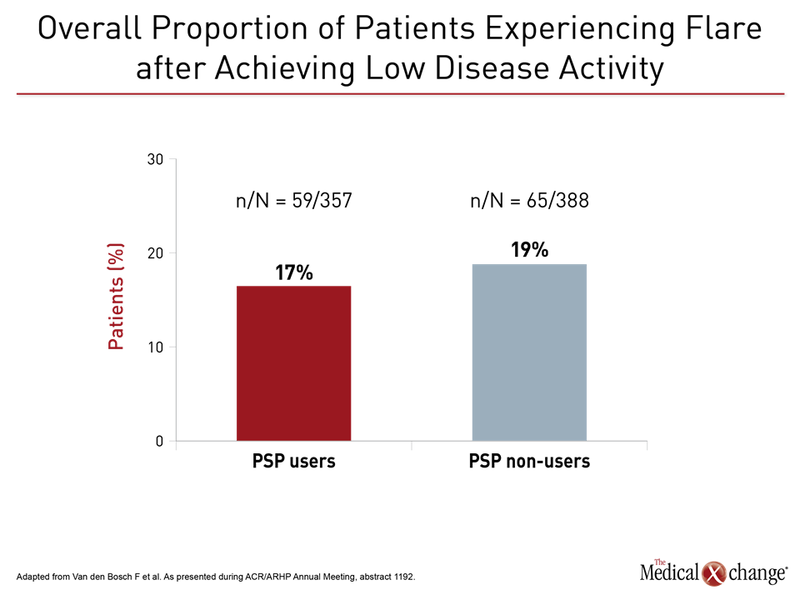 In new data from the PASSION study presented here, the goal was to evaluate the impact of PSP participation on risk of disease flare and regain of disease control. Disease flare was defined as a 0.6 increase or greater in DAS28-CRP on two consecutive visits. Disease control, also known as low disease activity (LDA), was defined as DAS28-CRP ≤3.2. Whether or not they were enrolled in the PSP, the incidence of disease flare was low, occurring in just 17% of PSP users and 19% of non-users, which may reflect that both groups were taking adalimumab. However, disease control following a flare was regained more often and more quickly in the PSP group through week 52. 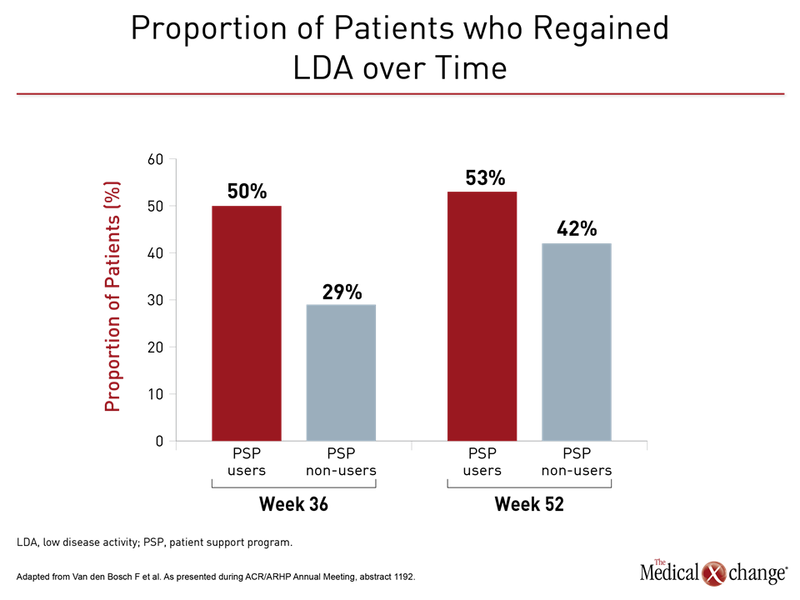 As a result, the proportion of patients achieving LDA at any time point was greater in the PSP group, according to Dr. Filip Van den Bosch, Center for Inflammatory Research, Ghent University Hospital, Belgium. In the observational PASSION study, 1025 RA patients taking adalimumab were enrolled at more than 150 participating centers in 14 countries. Of these, 499 were PSP users and the remaining 526 patients were treated with adalimumab without participating in the PSP. The adalimumab PSP involved patient education, treatment adherence reminders, newsletters, and a telephone hotline. Other aspects of the program, such as home medical delivery and financial assistance, were offered where needed and as appropriate within participating countries. “The PSP was intended to improve outcomes through multiple methods of interaction between caregivers and patients,” Dr. Van den Bosch explained. The substantial benefits achieved in the published trial were consistent with the treat-to-target principle of RA management. Although not demonstrated in PASSION, the advantage of tight RA control has the potential to prevent or modify the risk of joint structure damage associated with active inflammation. This new evaluation of the impact of a PSP on flares is consistent with the goals of tight control. Even though PSP users had more severe disease at baseline than non-users, including significantly higher swollen joint count (P=0.007), DAS28-CRP score (P=0.007) and HAQ-DI (P=0.045), only 17% of those achieving LDA in the PSP user group had a flare, which was numerically but not significantly lower than the rate of flares in the PSP non-user group after 78 weeks of follow-up (Fig. 1). When stratified at week 36, week 52, and week 64 time points for proportion of patients with a flare, the between-group rates of flares were similar, ranging from 3.3% to 7.1% at these intervals. 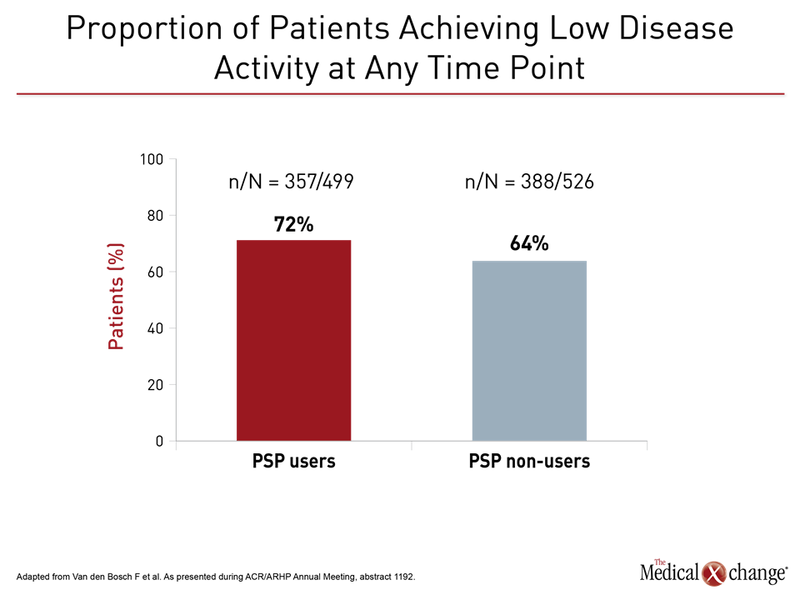 When compared for the proportion of patients who regained disease control, the comparison favored PSP users with up to 53% regaining control versus only 42% in the non-user group over these same intervals (Fig. 2). This was reflected in the proportion of patients achieving LDA at any time point. None of these differences reached significance, possibly due to the low rate of flares in patients taking maintenance adalimumab. Despite this outcome, the numerical difference favoring a PSP for regain of disease control once flares occur is consistent with evidence that adherence to therapy is the principle but not an isolated goal from offering a PSP. 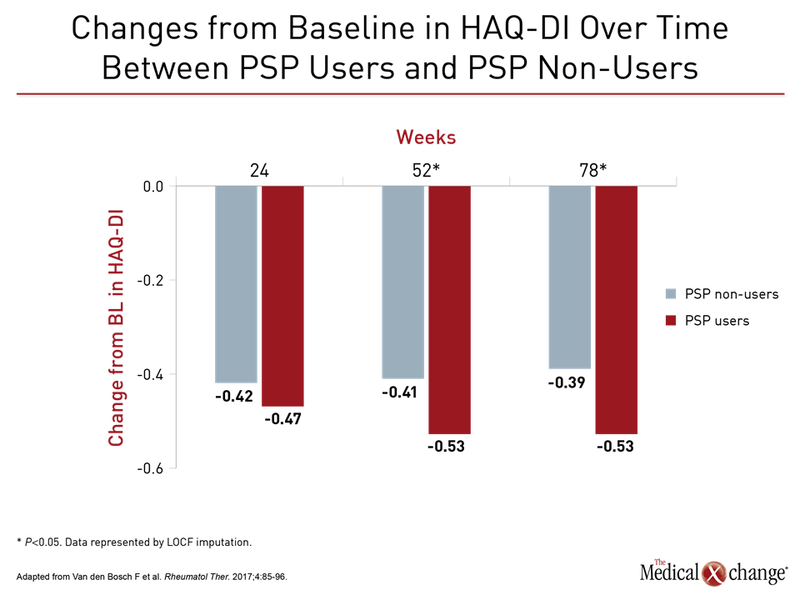 Although the PASSION study associated PSP participation with improvements in objective measures of disease activity, such as greater likelihood of achieving ACR20 and ACR50, the education and support inherent to an effective PSP may account for at least some of the improvement in patient-reported outcomes such as HAQ-DI. “Patients with moderate-to-severe RA who initiated adalimumab and participated in the PSP achieved an overall significantly greater improvement in clinical, functional, and patient-reported outcomes when compared to those who did not participate,” maintained Dr. Van den Bosch in the published PASSION results. He indicated that such programs support the goals of tight disease control. A proprietary PSP program for RA patients taking adalimumab, which was shown previously to improve clinical outcome, was associated with a numerical improvement in the proportion of patients who regained disease control after a flare. Although the advantage for PSP users versus non-users was not significant, possibly due to a low rate of flares in patients on maintenance adalimumab, more PSP patients achieved LDA at any time point, which is consistent with the goals of maintenance TNF inhibition.